Refer a new patient to Dr. West and you BOTH score a $25 gift card, and maybe even an iPad. Learn more. It’s simple. Just make an appointment with Dr. West and you’re entered to win. What could be easier? 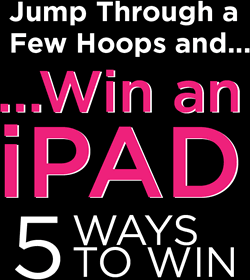 Visit our Facebook page, click on “Like” and you could be the winner of a nifty new iPad. “An iPad for your thoughts.” Share your experience at our office on Google Reviews and you’re automatically entered to win. After your next appointment, you will receive a survey via e-mail. Send it back and you’re entered. It’s that easy!